Comprised of three models, PH10 PLUS motorised indexing heads each carry a range of probes and extensions and are able to be orientated into 720 repeatable positions for access to the most complex component features. The PH10 PLUS allows for inspection of features at varying angles without the need for time-consuming frequent stylus changes. All three of the PH10 PLUS models are supplied with a repeatability specification of just 0.4 µm (2σ), which is specified at a distance of 100mm, giving its operator a much more improved positioning at the stylus tip. Suitable for carrying long extension bars and complex probes like SP25 or TP7M. The highly-repeatable auto joint allows for change of either rapid probes or extension bars without the need for re-qualification. 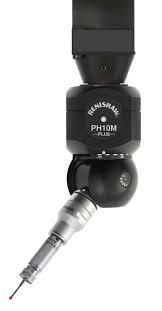 As a variant of the PH10 PLUS the PH10MQ allows the motorised head to attach directly to the quill and the B-axis of the head is integrated to the inside of the quill itself. The PH10MQ PLUS provides a shortened probe mount, appearing neater with the A-axis alone protruding from the quill. Similar to the PH10M, the PH10T PLUS features an M8 thread probe mount instead of the auto joint. Threaded probes, such as TP20 and TP200, as well as extension bars fit directly onto the head. This model is compatible with all Renishaw stylus and module change systems.